Who can really blame Chuck Norris for taking a boot to this 1992 Corsica? But hey, for $250, why not buy it just for the story? 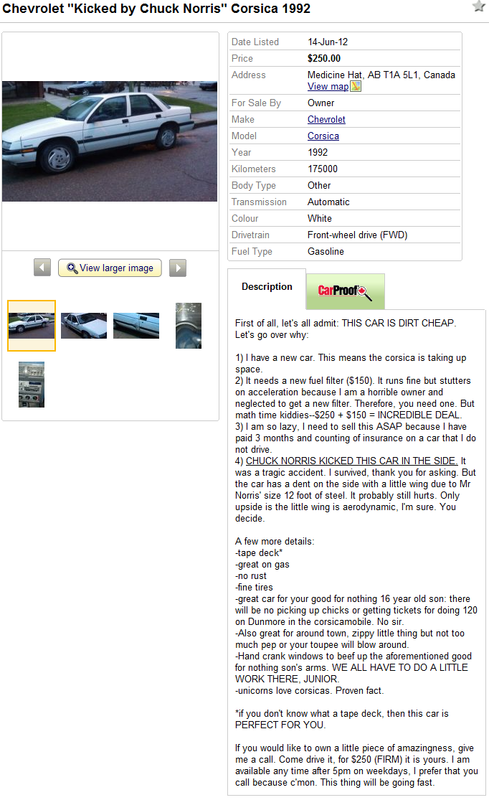 You'll still have to explain why Chuck was on Kijiji Medicine Hat. 1) I have a new car. This means the corsica is taking up space. 2) It needs a new fuel filter ($150). It runs fine but stutters on acceleration because I am a horrible owner and neglected to get a new filter. Therefore, you need one. But math time kiddies--$250 + $150 = INCREDIBLE DEAL. 3) I am so lazy, I need to sell this ASAP because I have paid 3 months and counting of insurance on a car that I do not drive. 4) CHUCK NORRIS KICKED THIS CAR IN THE SIDE. It was a tragic accident. I survived, thank you for asking. But the car has a dent on the side with a little wing due to Mr Norris' size 12 foot of steel. It probably still hurts. Only upside is the little wing is aerodynamic, I'm sure. You decide. -great car for your good for nothing 16 year old son: there will be no picking up chicks or getting tickets for doing 120 on Dunmore in the corsicamobile. No sir. -Also great for around town, zippy little thing but not too much pep or your toupee will blow around. -Hand crank windows to beef up the aforementioned good for nothing son's arms. WE ALL HAVE TO DO A LITTLE WORK THERE, JUNIOR. -unicorns love corsicas. Proven fact. *if you don't know what a tape deck, then this car is PERFECT FOR YOU. If you would like to own a little piece of amazingness, give me a call. Come drive it, for $250 (FIRM) it is yours. I am available any time after 5pm on weekdays, I prefer that you call because c'mon. This thing will be going fast.